Oak Bank mill was built in 1784 by Philip and George Antrobus as a cotton spinning mill. In 1806 it was occupied by Orme and Rogers. In the 1850s John Brier bought and demolished the mill in order to build a five storey cotton mill. In 1882 the mill was part occupied by George Holden, and in the same year there was a major fire (see witness description below). 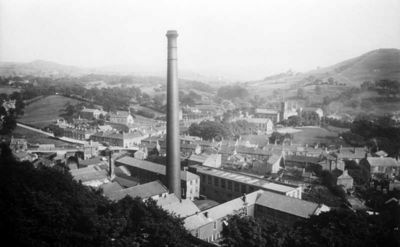 Around 1900 the mill turned over to cloth bleaching, dyeing and printing and this led to the formation of the Bollington Printing Company. Later, this was taken over by GUS (Great Universal Stores) who may well previously have been an important customer to the mill. The mill was extended in the 1960s by demolishing the cottages on the east side of Queen Street. Later the mill lay unused and became increasingly derelict. Part of it was used by Chesne Orme to develop his plastics recycling business, but this use ended after a fatal accident on the site. In the 1990s the remainder of the mill was demolished and domestic housing developed in its place. It is now known as Hamson Drive. The mill was originally water powered with a large mill pond beside Shrigley Road. More on mill ponds. The Harrop brook is of limited capacity, so a large pond was necessary to hold enough head of water to power a mill this size. The site was not an easy one on which to develop the mill or housing – the Harrop brook runs right through it and was put into a large stone built culvert. The mill was built over this, but modern housing cannot be built over a river like this and that explains why there is so much green space in Hamson Drive. Later, steam power was introduced, at one time in the 20thC consuming 250 tons of coal per week! In the early days the boiler chimney was created by building a flue in the ground up the side of Beeston, the high ground behind the mill, and exhausting it through a short chimney on top of the hillside. This can still be seen in the winter (no leaves on the trees) by standing in Hamson Drive and looking up the hill. This type of flue had its problems and so in 1912 a new 200ft tall brick chimney was built beside the boiler house. This was felled when the site was cleared for housing. When the original mill was built in 1784, it is apparent that Queen Street went from Bridgend to Defiance mill, as it does today, then across the Oak Bank mill site to join Ingersley Road where the roundabout is today. It seems that at some stage this road was closed and became part of the mill premises. Queen Street then passed up what was known as Defiance Brow to join Great High Street – Palmerston Street today. Many of the successful mill builders also built themselves a fine house. One time owner of Oak Bank mill, John Brier did just that. He built, in 1858, Oak Bank House, one of the biggest houses in Bollington, on the hillside overlooking his mill. The house suffered a fire and became derelict in the early 20thC and was demolished after WWII. The site is now occupied by Oak Bank Drive. Much of the following is taken from a document published in 1964 by the Bollington Printing Company Limited. The document was a handout at an exhibition about the mill and its products put on for the 1964 Bollington Festival. The dress lengths used in the display were later sold at the Fabric Shop in Bollington on Monday 21st September 1964, the proceeds being given to the Festival Committee fund. Oak Bank Mill was possibly the first cotton mill built in Bollington in 1784. The brothers Philip and George Antrobus built and developed the mill. In the 1850s John Brier opened his cotton mill at Oak Bank Works. 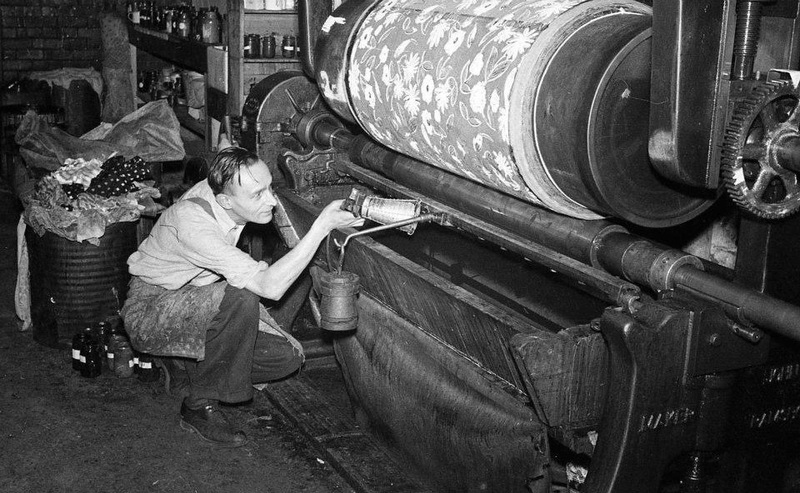 In those days spinning, weaving and printing were all carried out under the same roof. The firm suffered a setback in 1882 when a large part of the works was destroyed by fire. Jesse Beard1 was a small boy at the time and recalled his father calling out to his mother “Elizabeth, Oldham’s is on fire!” Oldham’s is what the business was known as then. Young Jesse stood on the bank2 and recalled seeing the roof falling in and the pipes hanging from the walls. The firemen were calling out for help because those who were pumping3 were exhausted. A Mr Wilson was the next proprietor of the mill and formed the Oak Bank Printing Company in the last years of the 19th century. 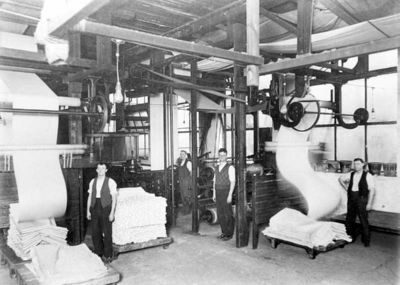 However, it was not until 1910 that the Bollington Printing Company was formed. From 1910 to the late 1960s the company was involved in the progressive use of cottons and was one of the leading producers of roller printed British fashion textiles. The cloth was received from the weaver in the ‘grey’. It was bleached or dyed in preparation for printing. The printing machines had multiple chromium plated copper rollers each adding its own colour to the cloth. Above the rollers were colour boxes and brushes to provide dyestuff to the engraved rollers. The cloth went through many processes to ensure fast bright colours. After printing, the cloth was steamed, aged, sprayed, oxidised, washed, dried, resinated, stentered, calendered, rewashed and dried, examined and rolled before it was ready for sale in shops or to the making-up trade as the finished article. 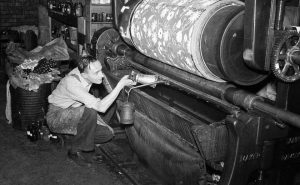 Although the Bollington Printing Company printed nylons, spun rayons, terry toweling and furnishings among other cloths, the principal fabric was fashion dress cotton which was then treated in finishing to give it whatever special qualities were required. For example, the ease of a drip dry fabric for washing or the warmth of a brushed surface, the silky look or the constant freshness of a crease resisting summer dress. The yardage of cloth going through the printing machines in one year would stretch 40 times to Brighton and back, would provide dresses for three million people and curtains for a million windows! The soap used each year to ensure our colours are fast would provide the average household with stocks enough to last 36,000 years! If all the bales of cloth received each year were piled on top of each other the pile would be more than ten times as high as the Cat and Fiddle! The electric power produced for running the works was enough to light the centre square mile of Bollington. Although modern [in the 1960s] oil fired plant was operated, the consumption of coal, when that fuel was used, was over 250 tons per week! During and after the second world war a stockpile of coal, more than 1,000 tons of it, was kept on the site of Oak Bank House, where the houses are on Oak Bank Drive today. Jesse Beard’s memories are taken from a newspaper article probably published by a Macclesfield paper in the 1960s. ‘bank’ probably referred to Pool Bank. In those days pumping for the fire hoses would have been done with a manually operated pump having a cantilever action with one or two men on each end. The water would have been taken from the river Dean or the mill pond next the Shrigley Road. James Harrison worked at the print works. 23/04/2008: We had a visitor at the Discovery Centre this afternoon making enquiries as to whether anyone had any information or pictures of a Langbridge & Co Diagonal steam engine reputed to have been installed at ‘Bollington Printworks’. The engine is described as twin cylinder (axes at 45 degrees to the vertical), 9 inch bore with slide valves and 12 inch stroke. Apparently it had no governor as it was normal practice to throttle the supply to control the engine speed. Apparently the engine is being reconditioned in Bolton and the visitor is thinking of making a model version of it. The gentleman was also asking for information about Bollington Printworks. I was able to tell him that Bollington Printing Company closed down sometime in the late 1970s, and up to that time it was tipping drums of dyes/waste onto the land that lies between Springbank and Hall Hill, off Henshall Road [Hall Hill fields]. The only photographs we could find at the Discovery Centre that seemed relevant referred to Oak Bank Print Works. It happened that Barbara Whitehurst came in later and said that she had worked at Bollington Printing Company in the 1960s, and it was known locally as Oak Bank Printworks. Do you have any information that I might pass on to the visitor? In particular, was Oak Bank the only printworks in Bollington? Did Oak Bank works have steam engines and do you know of any photographs? Is there anyone else you can suggest who would have knowledge of any such engine?